I thought I could swap rockshafts, but they are different diameters, so my first question is if there are bushings in the brackets to allow that swap, or not? Assuming there are not, my second question is if that welded on bracket is available as a part, or does it have a part number? How else could a fast hitch get added to a cub after purchase? Lastly, it looks like something that could be made and welded on, but I'm not sure what the pitfalls in doing that might be. Can it be done without removing the rockshaft? Would the heat from the weld damage the TC? Thanks for any help in getting the non-leaky TC mounted with the helper spring bracket it is now missing. This is my first time posting a new topic and I hope I am not misplacing it. This site has been so helpful to me and I am grateful for it. I used one cub for almost 20 years on two acres, but recently bought two more cubs needing to be revived. One had a fast hitch and a leaky late casting touch control. I bought an early casting TC to replace it, but the rockshaft on that one had no helper spring bracket. I thought I could swap rockshafts, but they are different diameters, so my first question is if there are bushings in the brackets to allow that swap, or not? Assuming there are not, my second question is if that welded on bracket is available as a part, or does it have a part number? How else could a fast hitch get added to a cub after purchase, if it needed the bracket? Lastly, it looks like something that could be made and welded on, but I'm not sure what the pitfalls in doing that might be. Can it be done without removing the rockshaft? Would the heat from the weld damage the TC? Brinly plow, disk, and cultivator. Here some pics of mine. But it’s the later unit. May not be helpful. Thanks for the photos, and apologies for doubling the first post. Someone (I think was Shane Nelson) added the helper spring bracket you needed. Maybe he will see this and comment. Should be able to take the fast hitch rockshaft along with the bearings that hold it and put it on the earlier unit, can you not? tmays wrote: Should be able to take the fast hitch rockshaft along with the bearings that hold it and put it on the earlier unit, can you not? Yes, the rockshaft with the helper spring has the larger diameter blocks that bolt it to the touch control. You should be able to simply swap the rockshaft and 2 pairs of blocks. I see in your info you have a 1952 Cub with Fast Hitch. The Fast Hitch came out in late 1954, at serial number 185001, so a 1952 Cub didn't have one originally. The newer Touch Control is block part number 360719R1. They have the larger diameter rockshaft, and helper spring arm. 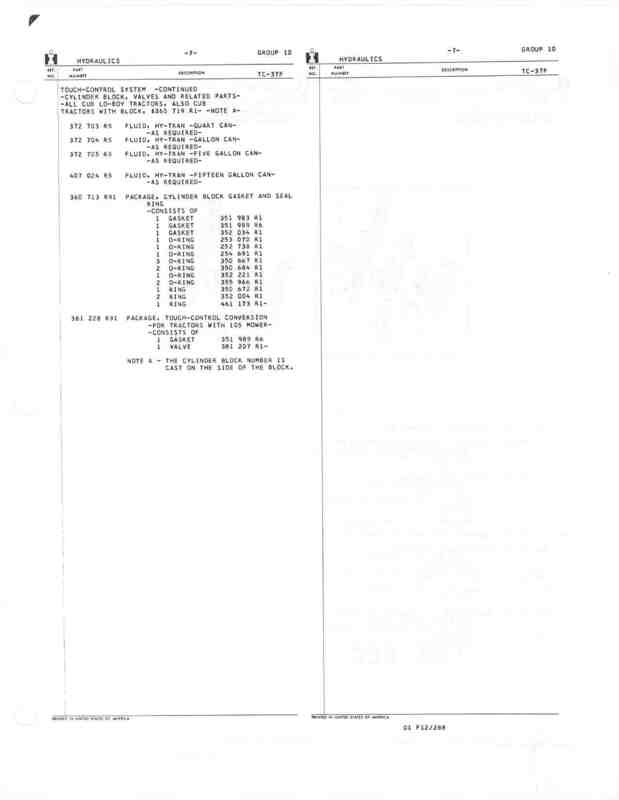 I think they did not come out until the Fast Hitch did, Raymond Durban's database show it also. The helper spring arm has no separate part number, it comes on the larger diameter rockshaft, the Cub parts manual shows. I think the rockshaft is not available through Case IH parts anymore. 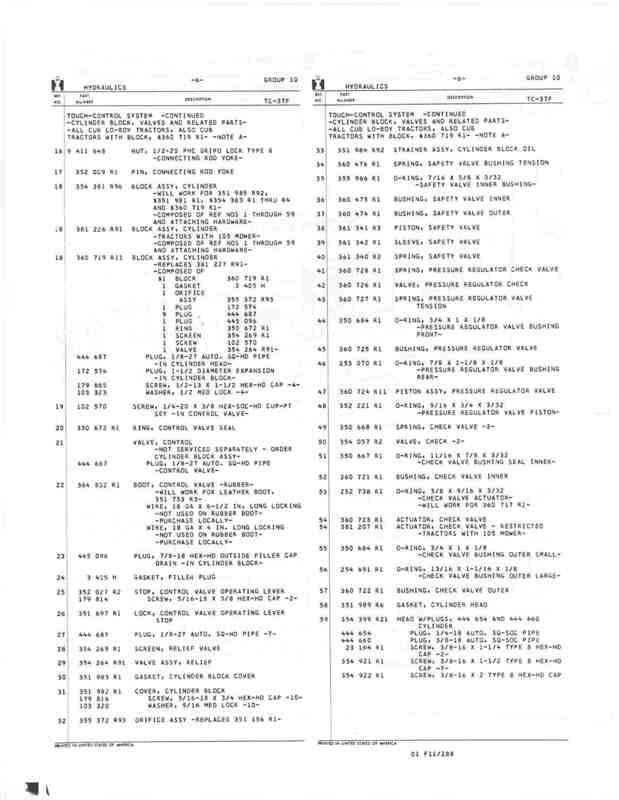 Below is a page from the parts manual. If the Touch Control is leaking at the front of the unit, under the rockshaft area, the control valve oring could be wornout and need replacing. Use a light and look up from below the unit, and see if you can see where the fluid is leaking from. It is not too hard to repair if it is the control valve, the valve slides out the front of the block. You might have to remove the manifold tubes, and the 4 bolts that hold the unit to the clutch housing, and turn the unit to the left to get the valve out. Clean the area, and valve well, and keep all dirt and grit off the valve when it is out of the unit. Use plenty of new Hy-Tran fluid on the valve and oring when putting it on the valve, and putting the valve into the block. Then, after repairing it, you will need to fill and remove the air from the unit, like the Cub owner's manual tells. 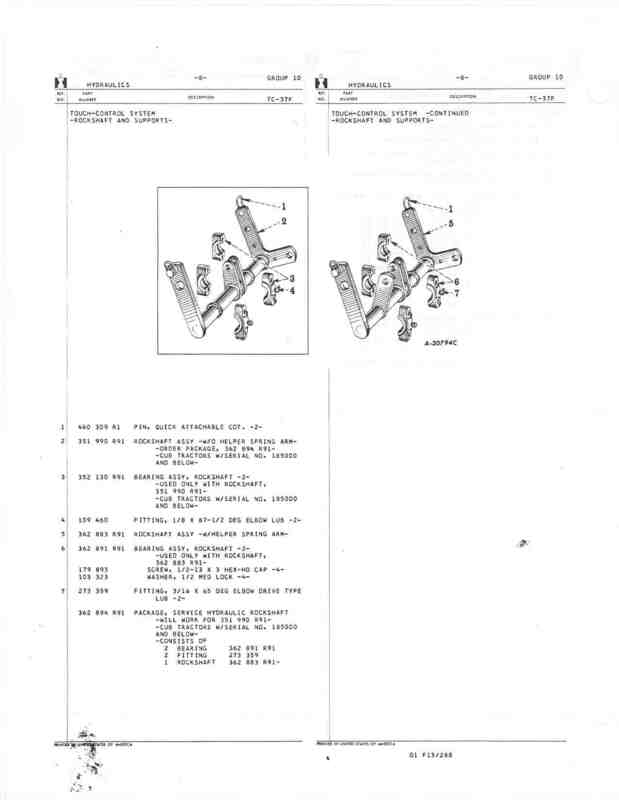 Below is a listing from TM Tractor showing the oring, there is a pic of where it is also. It could be leaking from the cylinder also, if it is, then the unit has to be disassembled to fix that. 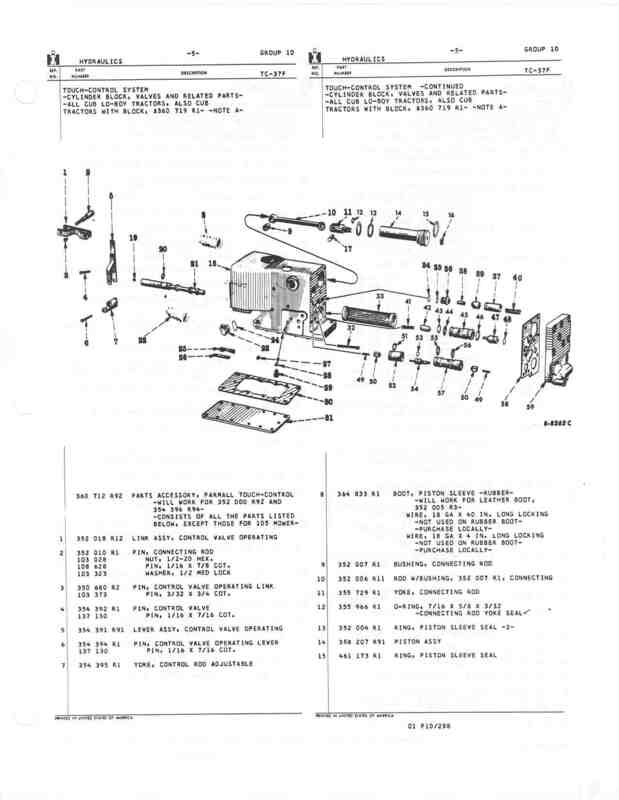 Below are pages from the Cub parts manual showing the newer Touch Control, if you need them. The new tractor is a 1960 and the TC has been repaired--I'm trying to upload the photos to show it but I don't see the upload attachment button anywhere on this board. I can't tell if the repair, a plate welded around the bolt holding in the rockshaft, will allow my to take the shaft and the mounting bearings with it too. But then the rear mounting bearings set into the early casting TC would still be too small, wouldn't they? I'm starting to think I should just take both TCs to a shop and have them make an identical helper spring bracket that could be welded on to the early casting TC rockshaft. I think I am too new to have upload attachment privileges--mystery solved. Below the box to type a post on here, is the Save draft, Preview, Submit buttons. To the left of those is the Attachments button. It is for attaching pictures. Push it, then the Add Files button that comes on. Then your stored pics will come on. Then select the pics you want from those. All 4 parts of the bearings have to be used with the right size rockshaft. The Fast Hitch can be used without the helper spring, if you are not lifting heavy loads. 790rivers wrote: ......I'm starting to think I should just take both TCs to a shop and have them make an identical helper spring bracket that could be welded on to the early casting TC rockshaft. The link to Shane's post above has a pattern with the dimensions. FH Helper Spring Fender reinforcement?